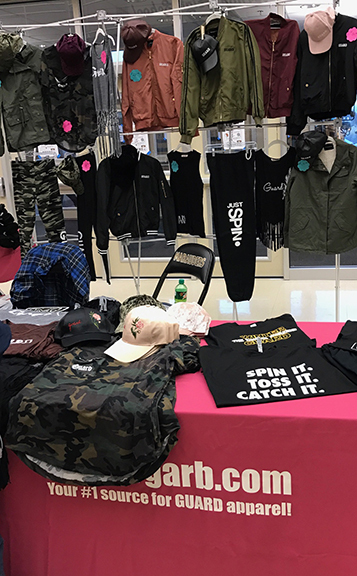 There is no easier way to fundraise for your guard than by selling WinterGarb.com merchandise on consignment at the Winterguard shows you host or attend in your local or regional circuit. WinterGarb is the industry's premier brand of Winterguard clothing and we introduce new, cutting edge line of apparel each season, as well as new additions throughout the season to keep the line fresh. Our clothing sells itself! Once you complete the form below and are approved for consignment, we ship you a big box of WinterGarb apparel the week of your show/shows. In this box is a list of inventory & prices, a Square Credit Card reader (for increasing sales by taking credit cards) and all instructions. All you need to provide is a table & change (1s,5s,etc...) to start selling. It's that simple. At the end of the show, you tally up what is sold and keep 10% of sales. This oftentimes ends up being in excess of $200.00 per event. We pay shipping both ways! What a great, easy and fun way to raise money for your guard! We only accept one consignment dealer per show and availability is limited. This program is delivered on a 1st come, 1st serve basis. Join the WinterGarb.com team for fun and fashionable fundraising! What is your role in the Winterguard program? Are you interested in setting up at just one event or multiple events? When is the show you are wanting to consign at? Does your school/guard host a Winterguard competition? If so, where?